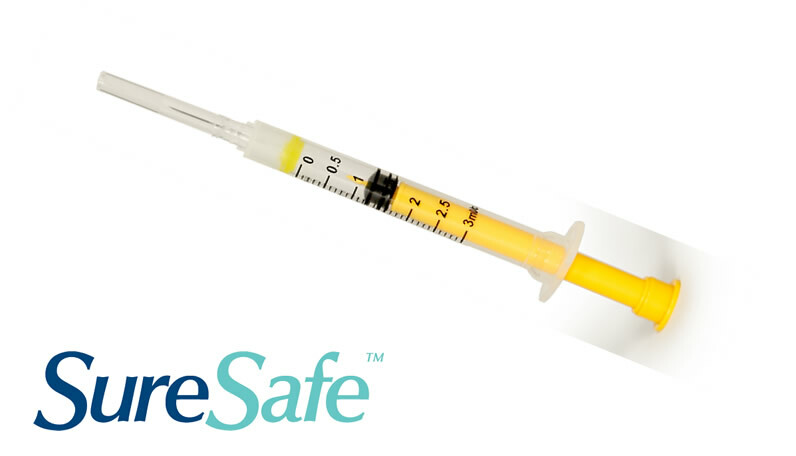 SureSafe™ is an exceptionally well engineered safety syringe with automatic retraction that fully addresses the accidental needle stick crisis that sees close on 1 million healthcare workers put at risk every year in the U.S. alone. SureSafe™ is available in 0.5ml, 1ml, 3ml, 5ml & 10ml with a variety of high quality needle bores and lengths. Simple single-hand use, the SureSafe™ is an extremely cost effective syringe when compared to the competition, with the added benefit of up to 50% saving on Sharps containers and disposal charges.